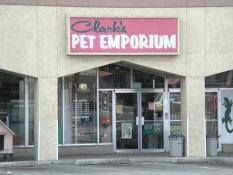 Clark’s Pet Emporium supports several organizations in their efforts to find adoptive homes for needy cats and dogs in Albuquerque. If you are looking for a new addition to your household we encourage you to come in and see Kitty City at our Menaul location or take a peek at our Cats Around Town satellite in our Lomas store. If canine companionship is more your style, we do occasionally host adoptions. Check out our events calendar or follow us on Facebook for updates. You can also follow the links below to websites that will help you search for just the right cat or dog. We are happy to have Cats Around Town (through Animal Humane of NM), an adoption satellite at our Lomas location. We are proud to announce we have helped to find homes for over 100 cats through this program. Our Menaul location hosts Kitty City, run by the Peoples Anti-Cruelty Association (PACA) a unique, free-roaming enclosure housing felines awaiting new parents. PACA volunteers are not always be available. And Kitty City will be closed to the public without the volunteers on hand. If you wish to interact with the cats please call ahead to see if a volunteer is in the store. Or contact a PACA volunteer directly at 505-255-0544.